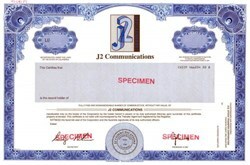 Beautifully engraved SPECIMEN certificate from J2 Communications. This historic document was printed by the Security-Columbian Banknote Company and has an ornate border around it with a vignette of the company's logo. This item has the printed signatures of the Company's President and Secretary. 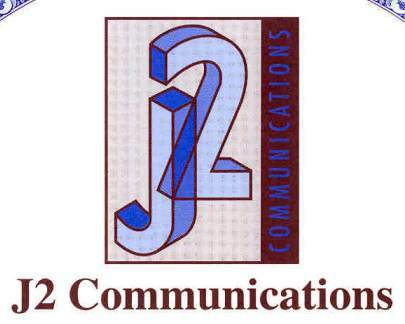 J2 Communications (Lampoon) is active in a broad array of entertainment activities, including feature films, television programming, interactive entertainment, home video, comedy audio CD's and book publishing. The company also owns interests in all major National Lampoon properties including "National Lampoon's Animal House," the National Lampoon "Vacation" series, and "National Lampoon's Van Wilder. The new "National Lampoon Network" currently serves over 400 colleges and universities throughout the United States, including major institutions of higher learning both in and out of the Pac 10, Ivy League, and Big 10. The network reaches as many as 3.5 million students, or nearly one in four of all 18 to 24 year old college students. In the 1970�s and 80�s, National Lampoon was the most widely read publication on college campuses, while today, the website, www.nationallampoon.com, is one of the most popular humor sites on the Internet. Since the launch of nationallampoon.com, the famous "NatLamp" brand of humor is now available worldwide. The site will also serve as a launching pad for future comedy projects in motion pictures, television programming, multimedia, books, audio, video, and a wide array of merchandise.